He started off with a single photo in the Newquay Voice, of a Minke Whale washed up on a local beach. The photo was taken on Porthcothan Beach. He then sent some underwater photo’s to the paper and they were well received. The paper decided to run a double centre page spread in their Christmas edition. Mark wrote an article about the common dive sites around Newquay, to accompany the photos. The Falmouth edition of the West Briton newspaper used one of Mark’s photo’s without permission, after acquiring it from the person on the in the photo. The photo was supposed to be in conjunction with the Dollar Cove article, the photo they used was nowhere near Dollar Cove and actually on the wreck of the Hera, many miles away, a year or so before. During Sport Diver magazines trip around the country, diving dive sites shallower than 18m they wanted to dive the Hera, just outside of Falmouth off Nare Head. It’s a cracking little dive, but due to conditions they couldn’t get out to it. They wrote the article based on what people had told them, they used some of Mark’s photo’s he had taken on a previous dive. Mark did say they weren’t his best and were taken in bad vis, so they were probably quite accurate considering the sea conditions at the time. Next he had some underwater video footage appear on the BBC. After an enquiry from the BBC he sent them some tapes of a recent archaeology project (Lizard Archaeology ) he was involved in, the response from BBC’s Inside Out Producer/Director Mick Catmull was ‘There’s some good stuff there Mark, thanks!’. The program was shown on BBC1 on September 26th 2007. 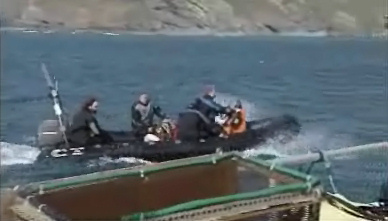 The photo below is a frame grab from the BBC’s replay off their website, Mark is actually pictured skippering the RHIB. The BBC were also interested in some more footage he was working on. Since then he has supplied a lot of footage to the BBC and other channels. The next article to feature Mark’s photo’s was in the 25th of October 2007’s Falmouth & Penryn edition of the West Briton, the article was about the concern of Scallop dredging in the area, it showed some of Mark’s photo’s of the wildlife from the area. BBC Inside Out West showed their version of the Lizard Archaeology article. They used different underwater footage from the South West version, all supplied by Mark. BBC One Show – featuring Mark cutting a trawl net away from the Manacles reef, Mark also supplied some underwater footage for the show. The rest of the underwater footage was filmed by Jeff Goodman. BBC Spotlight – Interviewed regarding a 1684 ex pirate ship. CNN News – Clip of plastics in our oceans used. Falmouth Underwater – Book, Paperback and Kindle versions available, written by Mark Milburn.